What survey questions should I ask? There are many things you could ask your team about. They can be work related or personal questions, questions asked to everyone on the team or just several people, questions answers to which are shared with everyone or just several specific people. We've pre-populated several questions for you from the onset, so you can quickly get started. To put one of them live, just go to the survey page and click Set it live button. There are also a number of pre-created templates for you to use when you create a new survey. You can pick one of them or create your own. Beside that we've created a research-backed bank of questions for you to use as an inspiration. 👔 How do you feel about the level of your manager's involvement? Is it too much, too little or just right? ⛑ What do you appreciate about your manager and is there anything you find frustrating? ⭐️ How can I be a better leader? 🌚 What characteristics didn't you like about your previous managers? 🐿 How could we change our team meetings to be more effective? 🌻 Are there any processes that you find to be very helpful and supportive? And are there those you find frustrating? 🎻 Are you comfortable with the level of responsibility that you have? 🙋 Are there any extra responsibilities you would like to take on? 😐 What challenges are you facing? Where are you stuck? 👍 Do you know what good or great work means for your role? 👮 Do you have enough authority to do your job? 🎯 Do you feel like you’re making progress on your big goals here? Why or why not? 🛫 Do you know what you need to do to move to the next level of seniority? 🎨 If you could design your own role, what would it be? 💬 Do you feel you’re getting enough feedback? 🌱 What is our company doing, or can be doing, to make you more successful? 💝 If you could have more time during the workday for one thing of your choosing, what would it be? 💡 How creative do you think we are? 🍒 What do you like about our culture? ⛳️ Which company values do you like the most and which the least? Why? 🌿 What are the qualities that you think each new hire should have concerning culture fit? 👻 What is the best thing that happened to you this week? 😻 What’s the most meaningful part of your job? 🏓 When do you have the most fun at work? 🤔 If you were the CEO, what’s one thing you would do differently? ⚔️ If someone was going to come along and put us out of business, what would they do? 🗒 If we could start over from scratch, what should we do differently? 🏆 What were some great things done by your teammates? 🏅 Do you get recognized for your work? 👯 Who is a teammate you can trust and depend on? 🙇 What would you like to hear from your manager that would help you feel motivated and successful in your job? 🙊 What is everyone thinking, but nobody says publicly? 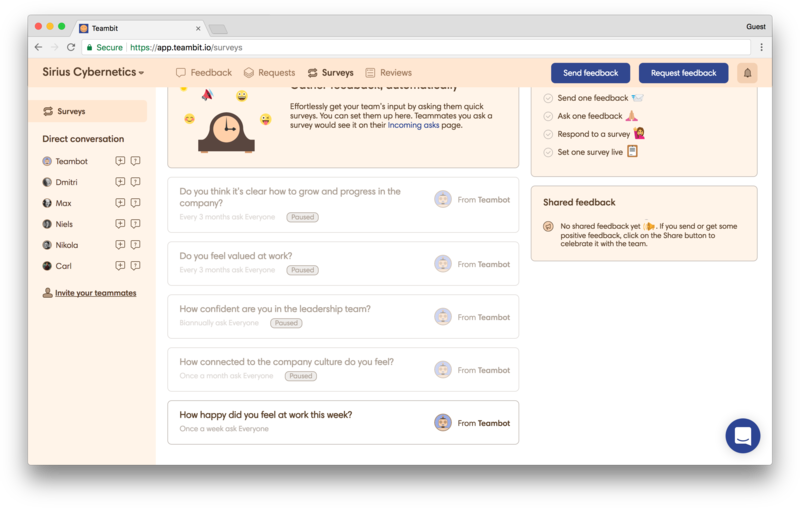 🙅 What’s going on in our team right now, that if not resolved, would make you want to look for another job? 🌅 What was the best day of your life and why? 🌋 What was the worst day of your life and why? 📖 What is the most interesting book you’ve read in the past 6 months? 💎 What’s the strangest talent you have? 🎸 Can you play any instruments? 🔋 How do you recharge? 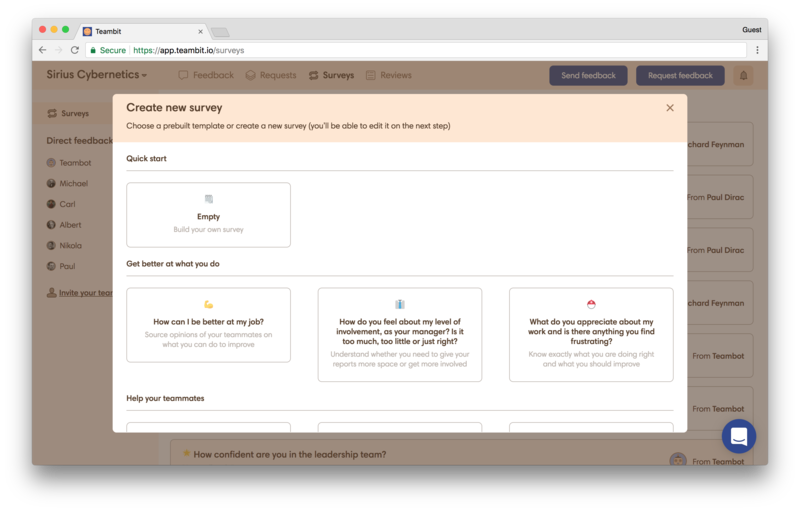 If you want to create a new survey with one of these questions, check out this guide on how to do it. Also, if you would like to do an evaluation, you should check out these example questions for reviews.